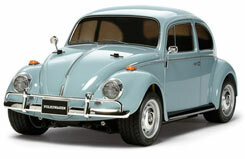 All Products > "58572 Tamiya 1/10 VW Classic Beetle (M-06"
The Volkswagen Beetle needs little introduction to most people around the world. A record 21 million Beetles were produced over a production period spanning 60-plus years, and the distinctive rounded form of the car is a familiar sight. It was the brainchild of the famed German designer Ferdinand Porsche, and the iconic car saw military service during the Second World War. The R/C model of this car was released in 1996 on the M-04 chassis. The 2013 model now sits on the modern and highly popular rear wheel drive M-06 chassis platform.